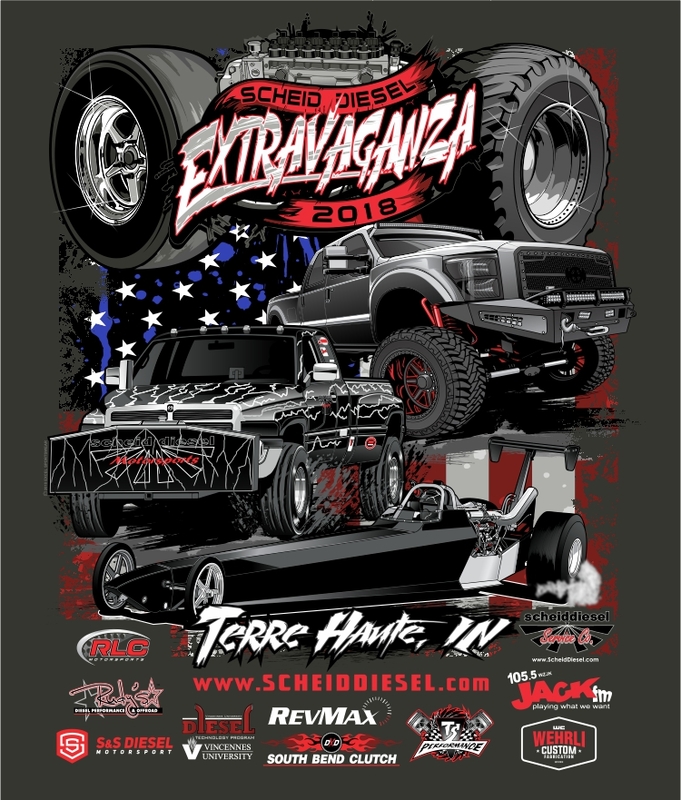 The 2019 Scheid Diesel Extravaganza will be held on August 23-24 at the Wabash Valley Fairgrounds in Terre Haute, Indiana. This event began in 1997 as a TDR Rally in Effingham, Illinois. Due to the tremendous turnout the TDR Rally evolved into the Scheid Diesel Extravaganza (SDX) and relocated to Terre Haute, Indiana in 2000. Attendance is expected to exceed 15,000 for the 2 day event. The additional space of the Wabash Valley Fairgrounds allowed Scheid Diesel to open the event to all makes of diesel pickups. New for 2019 event is now a 2 day event, all the same great action you expect from the Scheid Diesel Extravaganaza packed in to 2 days now instead of 3!! The Wabash Valley Fairgrounds & Crossroads Dragway is conveniently located 1 mile south of I-70 on US Hwy 41. The address is 3901 South US Hwy 41, Terre Haute, IN 47802. You will need to book hotel rooms early for this event. There is also plenty of onsite camping but water and electric hookups are limited and first come first serve. The Scheid Diesel Extravaganza is THE Diesel Event of the year you don't want to miss it!! Friday and Saturday Include: Show-N-Shine Contest (presented by Purdue Diesel Club), Vendor Midway, Dyno Contest (sponsored by Edge Products), the Lucas Oil Pro Pulling League Truck Pull qualifications start at 11AM, Outlaw Diesel Super Series Drag Racing, Saturday Kiddie Pedal Pull (presented by Pullers For Christ), with the Lucas Oil Pro Pulling League Truck & Tractor Pull Each Evening. Sign Up for our Newsletter to keep up to date.